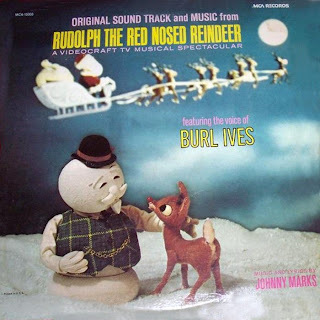 I JUST WAS CHECKING IN ON MY TWICE DAILY ROUNDS OF MY FAVORITE BLOG LINKS, AND CAME ACROSS A TREASURE TROVE OF CHRISTMAS MUSIC SHARES AT ERNIE (NOT BERT) BLOG. THANKS FOR SHARING!!! 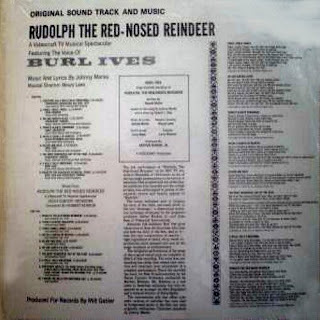 "Rudolph the Red–Nosed Reindeer is a long-running Christmas television special produced in stop motion animation by Rankin/Bass. It first aired December 6, 1964 on the NBC television network in the USA and was sponsored by General Electric. 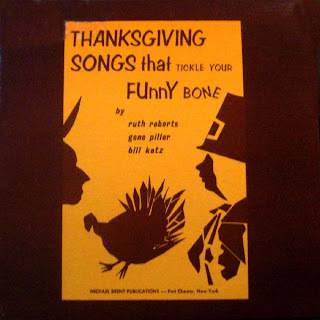 It is based on the song by Johnny Marks, and in turn taken from the 1939 poem of the same title written by Marks' brother-in-law, Robert L. May. 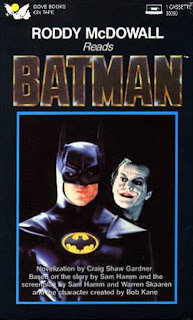 Since 1972, the special has aired over CBS, who unveiled a high-definition, digitally remastered version in 2005. I'VE HAD SOME INQUIRIES ABOUT MY TOE OF FROG MEDIA SALES WEBPAGES. SO I THOUGHT I'D MAKE THIS OFFER HERE. I CAN TURN ANY OF THE SHARES ON BOTH OF MY BLOGS INTO HIGH QUALITY AUDIO CDs FOR $5.99. ALL CDs COME WITH SLIM-LINE CD CASE, FULL-COLOR HIGH GLOSS GRAPHICS (FRONT AND BACK COVER SCANS IF SHOWN ON THE BLOG), AND INKJET PRINTING DIRECTLY ON THE CD. I CAN DO A FULL-SIZE JEWEL CASE FOR $1.00 EXTRA. BACK GRAPHICS ONLY IF I HAVE THEM SHOWN ON THE BLOG. IF NO BACK COVER SCAN SHOWN ON THE BLOG I CAN DO A BACK INSERT FEATURING MY OWN ARTWORK, AND A TRACK LISTING. I ACCEPT PAYPAL OR MONEY ORDERS. LEAVE A COMMENT HERE IF INTERESTED. THANKS!! The Grinch has successfully displaced Ebeneezer Scrooge as the spirit of anti-Christmas for today's audience. And there are similarities. Just as Tiny Tim was a strong factor in Ebeneezer's redemption, the children are a strong factor in the Grinch's redemption. 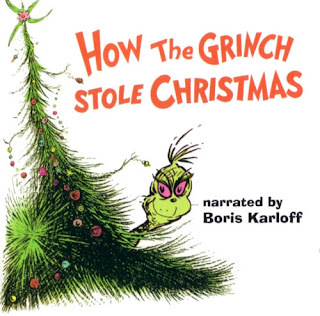 It's a pleasure to be able to hear the great Boris Karloff narration, along with the songs, and then afterwards to again hear the songs reprised. Of course, this is a short CD, just barely 30 minutes in length. One must realize that while the program was supposed to be a half hour long, nearly a third of the time was used for toy advertisements. The irony of it all, a beautiful story telling us that the joy of Christmas is in the spirit of Christmas, not in the getting toys is aired for the purpose of selling overpriced and non-imaginative toys. 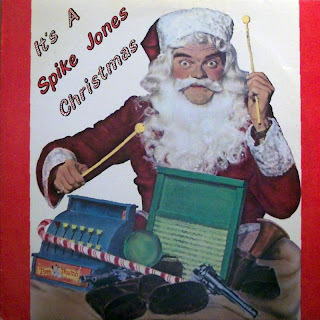 It is actually a pretty good collection of Christmas Songs picked out by Spike's Kids. With that Spike Jones typical zanyness thrown in here and there. 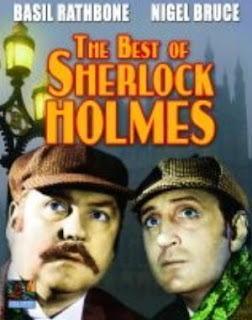 This is a Basil Rathbone Sherlock Holmes OTR Show called "The Night Before Christmas". Basil Rathbone as Sherlock Holmes OTR "The Night Before Christmas"
Basil Rathbone Reads "Twas The Night Before Christmas"
"A CHARLIE BROWN CHRISTMAS"/"IT'S CHRISTMASTIME AGAIN, CHARLIE BROWN"
Charlie Brown tries to sell wreaths door-to-door because he wants to buy Peggy Jean a nice pair of gloves. Peppermint Patty worries about her Christmas book report. Although it was first shown on CBS in 1992 (and would be the last Peanuts special to have its television premiere on that network), a VHS release was made available at Shell gas stations a few months prior, which would make this the first Peanuts special released directly to video. 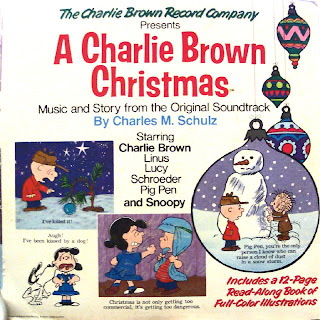 Paramount gave it another video release in 1996, and it can now also be seen as a bonus special on the DVD of A Charlie Brown Christmas. It was dubbed by Universal Studios. 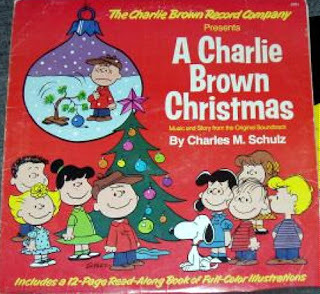 ABC has combined It's Christmastime Again with A Charlie Brown Christmas in its most recent annual broadcasts, airing its separate stories directly afterwards but without the special's own title sequence. YTV still airs it as a stand alone special. This is the first Peanuts TV special since It's Arbor Day, Charlie Brown to make use of the famous Vince Guaraldi music scores, even though he died in 1976. The old music was remixed into soft-rock versions for many of the 1990s Peanuts specials." 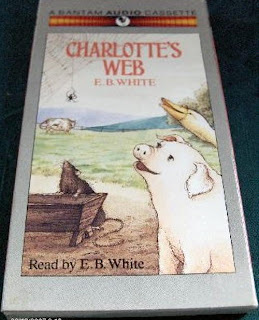 CHARLOTTE'S WEB CARTOON AUDIO RIP (Originally On Paramount/EFI Records SPFL 285 Stereo 1973)/ALSO E. B. WHITE READING "CHARLOTTE'S WEB"
THIS ONE COMES BY WAY OF ONE OF MY BLOG READERS. I APOLOGIZE I DON'T RECALL HIS NAME, AND COULDN'T FIND THE COMMENT WHERE HE SAID HE WAS SENDING IT TO ME. YOU KNOW WHO YOU ARE, AND THANK YOU FOR SHARING. 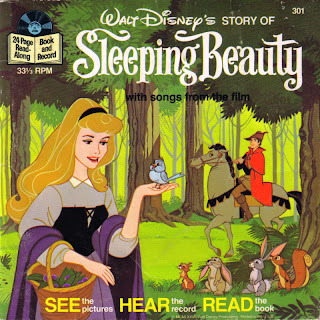 IN THE SAME STYLE OF LP I THOUGHT I WOULD LINK TO ONE OF TONY'S LPs AT HIS GREAT "WAY OUT JUNK" BLOG CALLED MUSIC AND STORIES FROM ORIGINAL HIT TV AND MOVIE CARTOONS. "In 1960, King Features Syndicate commissioned a new series of Popeye cartoons, but this time for television syndication. 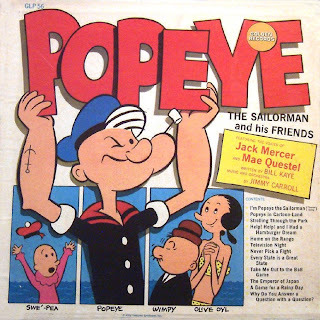 Jack Mercer (Popeye), Mae Questel (Olive Oyl & Betty Boop), and Jackson Beck (Bluto) returned for this series, which was produced by a number of companies, including Jack Kinney Productions, Rembrandt Films, Larry Harmon Productions and Paramount Cartoon Studios (formerly Famous Studios). 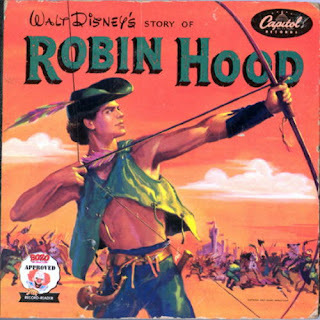 The artwork was streamlined and simplified for the television budgets, and 220 cartoons were produced in only two years, with the first set of them premiering in the autumn of 1960, and the last of them debuting during the 1961-1962 television season." Mercer & Questal receive credits as voices on this LP. Writing by Bill Kaye, with Music and Orchestration by Jimmy Carroll. 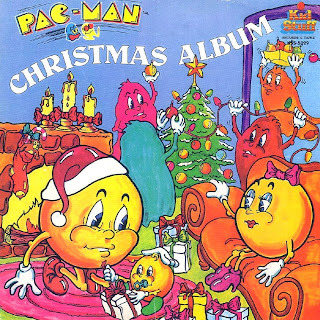 A COLLECTION OF PAC-MAN'S FAVORITE CHRISTMAS SONGS ALONG WITH A STORY OF PAC-MAN'S FAMILY AND THEIR MOST EXCITING CHRISTMAS. 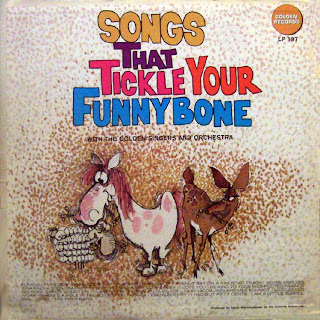 THIS IS YET ANOTHER IN THE ONG LIST OF KID STUFF NOVELTY TYPE LPS, MANY OF WHICH WERE WORD FOR WORD SOUNDTRACK RIPS FROM CARTOONS BY THE SAME NAMES. A GOOD ONE FOR THE CHILDREN THOUGH I SUPPOSE. ENJOY!!! 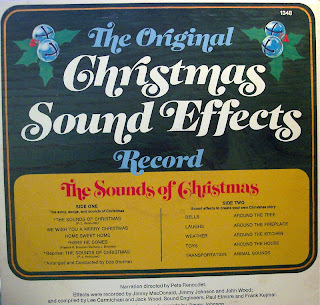 I shared this on a separate web page, but in line with the Disney's "Sounds Of Outer Space" LP I shared HERE, I thought I would share the Christmas LP also. 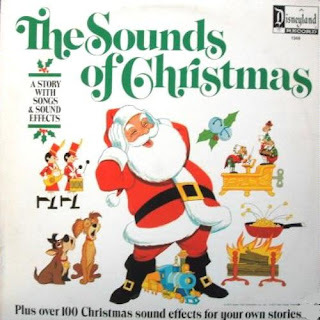 Both the Christmas LP, and the Space LP are made in the similar fashion as Disney's "Chilling, Thrilling Sounds Of The Haunted House". 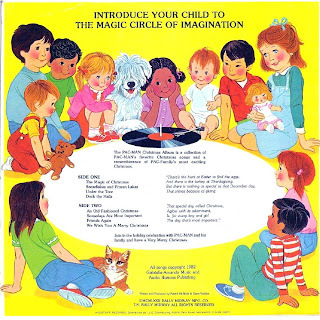 Each of the 3 LPs has one side using the sounds in story fashion, and then the second side of all 3 LPs are the indiviudal sounds that you can use to make your own stories with. I SHARED THIS SEE, HEAR, READ, RECORD AND BOOK SET HERE. THE FOLKTELLERS "TALES TO GROW ON"
Barbara Freeman is the pioneer of pioneering storytellers, NSA (National Storytelling Association) recipient of: "Circle of Excellence Award", Our Nation’s Oldest Folk and Dance Festival’s “Most Outstanding Performer Award,” as well as numerous storytelling recording honors. Entertaining keynote conference speaker, teller of witty Appalachian tales and true legends of saints and heroes. Over thirty years of delighting audiences throughout Asia, Europe and America with wholesome, heartwarming, hilarious and energy-filled performances. Offers dynamic programs for schools, libraries, churches, conventions, and major folk, music, and storytelling festivals. Fun and informative in-service workshops for teachers and librarians, as well as residencies for students of all ages. "Barbara has the comic timing of Lucy" (Carmen Deedy). “She is a powerhouse performer in the world of words and imagery” (Arts Outreach of Solvang, CA). 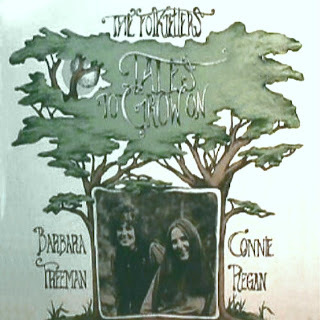 In previous years, Barbara traveled with Connie Regan-Blake (her cousin), on storytelling tours throughout the world, gaining international acclaim as the famous tandem duo "THE FOLKTELLERS.” “The ancient art of storytelling is alive and well…primarily because of Connie and Barbara” (Spencer Christian, ABC’s Good Morning America). "Tales To Grow On" for children K-6th grades. Winner of American Library Association's (ALA) Notable and Distinguished Recording Award. I'm not sure why I did a scan of the back cover and not the front, but I came up with the best front scan I could. You can find a share of another LP from The Folktellers called "Chillers" HERE.